As you know, Mary and I both try to eat whole, real foods but our diets still vary from day-to-day. Mary and her husband James try to eat Paleo as much as they can while I try to prioritize a sugar-free, gluten-free diet. But here’s the thing – we aren’t perfect and we aren’t trying to live by any set of “rules.” We try to eat real food and listen to our bodies. If something makes us feel sick (gluten has that effect on both of us), then we take it out of our diet and see if we feel better. So while Mary avoids most dairy (but hey she sure loves full fat cheese) – I don’t really mind keeping it in my diet. I don’t drink cow’s milk as a beverage but it doesn’t bother me if I have Greek yogurt, cheese or a milkshake. So when Chobani contacted me about collaborating on some recipes – I was thrilled! I’m hoping to share a few more in the next month (before my shipment of their yogurt disappears out of my fridge) so stay tuned. It contains a lot of protein. Like 22 grams per serving (when using the low-fat yogurt). It’s only made up of about 5% lactose. They don’t use any thickners. They source their milk from cows NOT treated with rBST (a growth hormone). It’s gluten-free, free of artificial sweeteners and vegetarian. 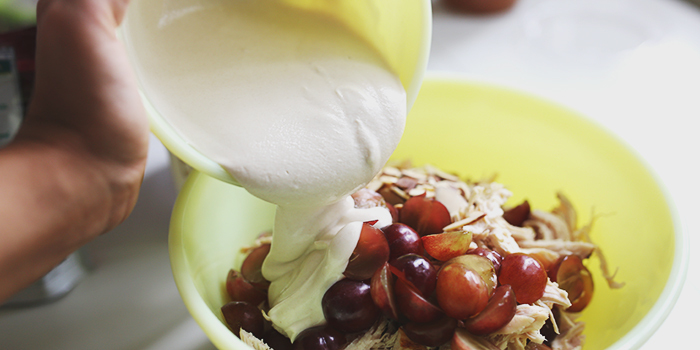 Chobani has this great guide for substituting their yogurt for other ingredients! Gather all your ingredients together and figure out how you’d like to cook the chicken. I prefer grilling (it keeps my kitchen cool and the chicken tastes great) but you can cook it however you’d like. I turned on the grill and let it heat up while I prepped the other ingredients. Once the grill was ready – I placed the three chicken breasts on and let it cook slowly. I don’t like tough, dry chicken (but that’s just me). Once the chicken was done I set it aside to cool. I sliced the grapes in half and once the chicken was cooler, I shredded it. 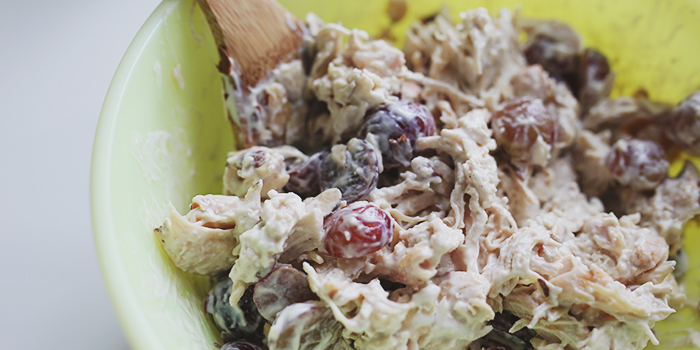 Combining the grapes, sliced almonds and chicken – I set it in the fridge while I made the chicken salad dressing! I combined the Greek yogurt, dijon mustard and stevia in a separate bowl and then poured the mixture over the chicken/almonds/grapes! Mix and toss everything so that the dressing it distributed evenly. And you’re done! I prefer to refrigerate a bit more before eating (I like my chicken salad to be really cold) and place on your choice of arugula, croissant or whatever else sounds good! I especially love this recipe because it can keep in the fridge all week and I don’t even have to think about what to eat for lunch! 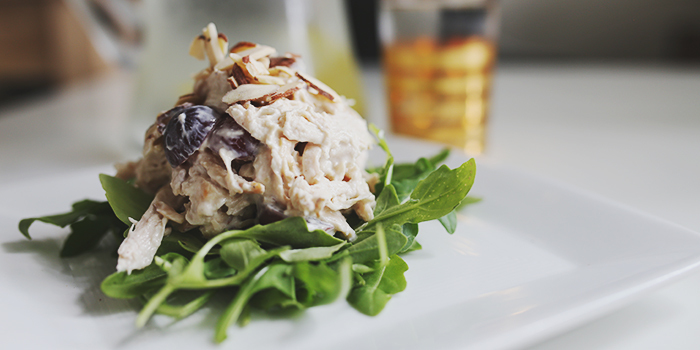 If you’re looking for a mayo-less, gluten-free easy chicken salad recipe – we GOT it! Figure out how you want to cook your chicken! I decided to grill my 3 chicken breasts. While the chicken is cooking, gather up all your other ingredients. Cut your grapes in half (I used about 2 bunches of purple grapes). Once the chicken is done cooking – shred it and set it aside to cool. Combine the Greek yogurt, dijon mustard, almond milk and stevia to make the dressing. 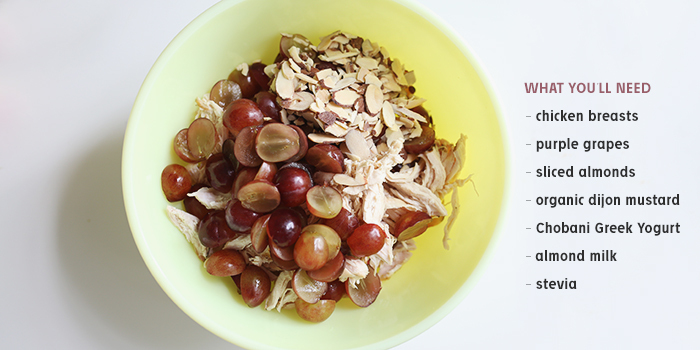 Combine the shredded chicken, grapes and sliced almonds. Pour the dressing over the chicken/grapes/almonds and mix well. Refrigerate to cool and serve over whatever sounds great (I chose arugula)! *Chobani sent me a shipment of their yogurt. All opinions and recipes are my own! I’m having a wisdom tooth extracted on Friday (one side only) and I’ve been looking for some softer, not super painful to chew foods that aren’t loaded with sugar (ice cream, sweetened applesauce, blah blah blah)– can’t wait to make this and have it chilled in my fridge for Saturday! We’re so glad we could help! Good luck with the sugery – definitely not fun but we hope the chicken salad keeps you full and pain-free! Hi — that is SO WEIRD that Chobani’s website (and your blog) says that they are vegetarian-friendly. Vegetarians do not eat animal products, including milk. Chobani uses a lot of milk to make their product, therefore it is not vegetarian. Hi Amber! We definitely keep in mind that some vegetarians don’t eat any animal products but here on Considering You, we know that many do. If we feature a food product that contains animal product we would definitely assume that it’s not vegan friendly. Lacto ovo and lacto vegetarians consume dairy and so we included that as a perk. Thanks for the reply! I must have been having a brain lapse yesterday morning. Of course, you are absolutely right. Vegetarians eat diary. I must have had veganism on my mind.